(Natural News) Researchers from the Universiti Malaysia Pahang have developed a way to upcycle waste oil products by transforming them into grease. Their findings, published in the Australian Journal of Basic and Applied Sciences, breathe new life into waste oil products – which are commonly discarded and become pollutants. In the study, researchers synthesized grease using waste oil and red gypsum – another waste product from making titanium oxide (TiO2) for cement. By using different types of waste oils and red gypsum, the team investigated which formulation had the best quality based on different ratios of red gypsum and fumed silica. For the study, researchers looked at ways to convert this waste into grease, in particular, the base oil that forms lubrication grease. Currently, the base oil used is mineral oil, noted for its stability when exposed to both high and low temperatures. In the tests, the team used different ratios of red gypsum and fumed silica to determine which formulation will produce the best grade of grease, according to the grades set forth by the National Lubricating Grease Institute. Particularly, the red gypsum-to-fumed silica proportions were 80–20, 60–40, and 50–50, respectively, and tests were carried out using standards from the American Society for Testing and Materials (ASTM). This meant that the new formulations were tested to determine their stiffness, an important factor in lubrication; the type of thickener used for each; the amount of oil separated, which is a key characteristic when grease is subjected under pressure; and, the dropping point for each, which reveals the ability of each formulation withstand extreme changes in temperature. The new formulations were compared against those that were already on the market. The team found that grease made from waste oils as the base material was found to be the most stable, with the resulting formulation passing all ASTM standards. 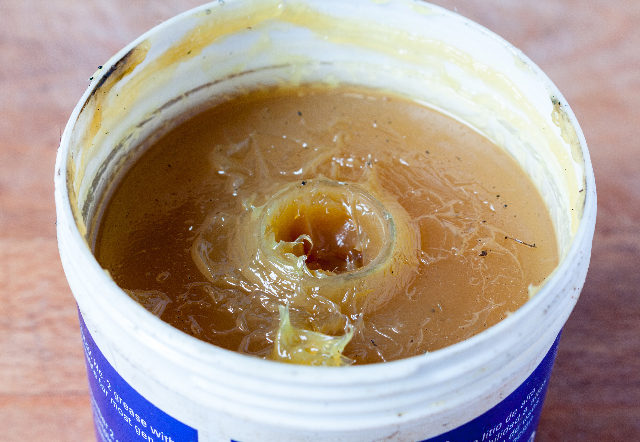 In addition, this type of grease had no dropping point even after being subjected to temperatures reaching 464 F (about 240 C), which indicated that the grease is able to withstand higher temperatures. Grease made from waste oils also had a low penetration number, which meant that it was firm and consistent for application, and it produced very little oil in the oil separation test, revealing that it was stable and can withstand pressure. According to the researchers, the application of red gypsum as a thickening agent helped in the stability of the grease. “Fumed silica was able to work as the thickening agent in the formulation of grease from waste oil) and it showed overall good performances,” researchers concluded their study. Find more sources of alternative fuel at Power.news.